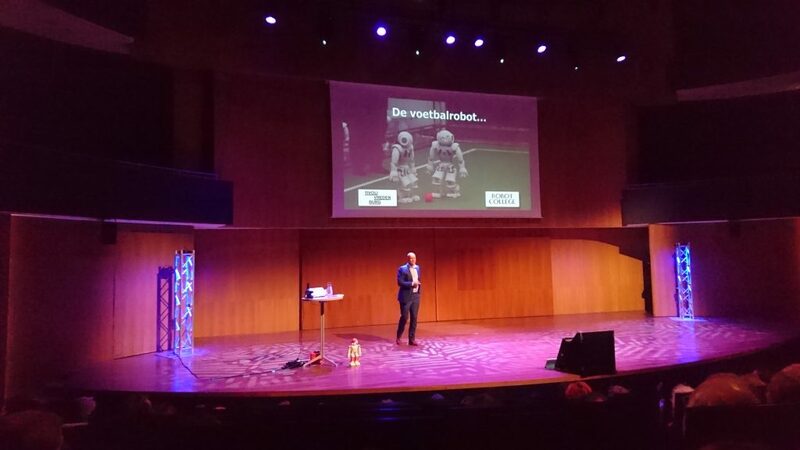 On October 19, 2017, I went to “The Big Lecture about Robots” at Tivoli Vredenburg in Utrecht, The Netherlands. Read my impressions below. The stage is set for an unusual event: a lecture about robots, and a big one, so the title promises. And there he is, the little robot. All spotlights on him, he starts to announce the event – in a robotic voice, of course. But as it turns out, that’s about all the little robot can do. 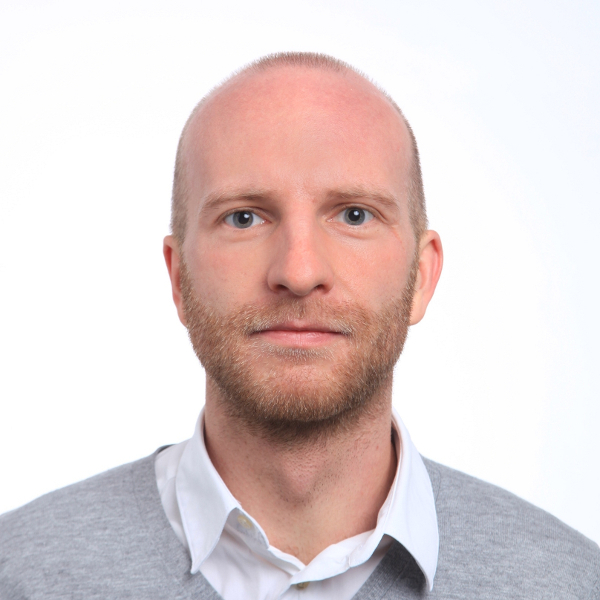 The actual lecture is still given by a human: Mathijs Bouman, journalist, and economist. Bouman starts with a definition of what he means by a robot. ISO 8373: A robot is “an automatically controlled, reprogrammable, multipurpose manipulator programmable in three or more axes, which can be either fixed in place or mobile for use in industrial automation applications”. He then gets back to the robot from the beginning. On the one hand, it’s cool what he can already do – but at the same time, it’s disappointing. This becomes the theme of the evening. Bouman shows a number of YouTube videos which raise expectations. One robot does yoga, the other beats champion Timo Boll at table tennis. As it turns out, the videos promise far too much. Currently, no robot can beat Timo Boll, and the world championship in robot soccer looks more like an exercise in patience than excitement. Robots in the real world do more profane tasks, like welding or moving materials. And they are good at it. Still, many of them have to be put in cages, as they are dangerous to be around. But things are changing. Robots get better at interacting with humans. Moreover, while technological progress has been incremental, prices of robots are dropping fast. As robots become cheaper, should we thus expect a robotics revolution? Bouman shows some statistics from the International Federation of Robotics. There is steady growth in the number of robots, but it looks far from exponential. This is not Moore’s law. Also, most robots are going be installed in China rather than in Europe. However, already now, the cost of a robot per hour can be lower than that of a worker in most countries: 6 Euros/hour, according to the Financial Times. But there are barriers which prevent robots from taking over jobs. The real world is complex and unpredictable, and robots’ senses pale in comparison to humans. There are also economic barriers: robots require large upfront investments, making it hard for smaller companies to adopt them. As on cue, the little robot speaks up: he needs to be recharged. Another limitation. What do we actually know about robots replacing humans? Fairly little. Economic research about the impact of robots is just at the beginning. So far, the evidence is mixed. For the UK, Graetz and Michaels find no effect of robots on employment. In contrast, Acemoglu and Restrepo find that in the US robots had a substantial negative impact, both on jobs and wages. Low-skilled workers were affected most. Are robots special? No, Bouman argues. They are just another technology which increases productivity. And the fear of technological change is old: the Amsterdam hand saw guild had fought the introduction of sawmills. Hence no reason to worry? Not quite. Bouman tells a simple story – a parable – to illustrate the effect of technological change on welfare and income inequality. Robinson and Friday live on an island. Friday is good at harvesting coconuts and Robinson catches fish. At the end of the day, they exchange coconuts for fish – and both are better off. These are Ricardo’s gains from trade. Then things change. Friday finds a coconut-harvesting robot which does all the work and collects more coconuts than he ever could before (turns out, such a thing exists). At the end of the day, coconuts are again exchanged for fish – and since Friday cannot eat all those coconuts, Robinson is better off as well. Inequality has increased, though. The next day, Friday also finds a fishing robot. He now has all he needs, and in the evening, there is no need for him to trade with Robinson anymore. Technological change has thus led to extreme inequality. In fact, Robinson is now worse off than at the beginning of the story, as he only has the fish he caught by himself. End of story? Not yet. The next day, Robinson goes to the forest and finds peppers. Friday is now willing to trade again. Also, Robinson happens to have a gun – and forces Friday to give up some of his wealth. Redistribution Robinson-style. Welfare increases. But not for long, as Friday takes off to Panama. The lesson according to Bouman: embrace technological change, but make sure that the gains are redistributed fairly. For this to happen, rather than taxing the robots, we should focus on closing tax havens. There should be no escape to Panama. While the story is insightful, it raises some questions. Imagine that instead of Robinson, Friday would have used all his wealth to get a gun. In other words, what if an extreme concentration of wealth went together with the monopoly on power? Also, what if Robinson hadn’t found peppers to trade with Friday? At the end of the lecture, Bouman highlights the need for education to equip people with the skills required by technological change. “We need to enable people to find peppers”, he says. All good, but what if there are just not enough peppers around – or if finding peppers is too hard for most people? These are challenges which need to be addressed. Moreover, while I agree with the need to close tax havens, it turns out that a tax on robots may be desirable (see my current research). For sure, this has not been the last lecture about robots.